Here is the latest in my Creative Prompt Series. You can to link to all my creative prompts via the list embedded below. Today I want kids to start with a dinosaur, or the idea of a dinosaur, and use that as the spark for some kind of creativity. While I go on to suggest some ideas to get kids started, I hope they will piggy-back off my ideas, and come up with better ones of their own. * If you were a dinosaur, which one would you be? Draw yourself in your habitat. You might like to name yourself something dinosaur-ish, like Tomosaurus, Lizziesaurus or Sarahdactyl. * Your dog always seems to be into mischief. One day he brings home an enormous bone and leaves it on your front porch. Turns out the bone is part of a dinosaur skeleton! How on earth did your dog find it? Share the story with someone else. * Create a dinosaur mask from cardboard or papier-mâché. * Imagine waking up on your birthday. There’s a box wrapped in birthday paper just inside your bedroom door. You race over, open it and —out comes a dinosaur! How did it get there? What kind of dinosaur is it? Describe it. What happens next? * Make plans for creating a dinosaur themed party for you and your friends. What will the decorations be like? What games will you play? Create a menu and a plan for a dinosaur cake. * If dinosaurs had not died out around 65 million years ago, what problems might there be on Earth today because of them? List as many problems as you can think of. What benefits might there be? List them separately. Which list is longest? * Create a dinosaur sock puppet. CBeebies have some simple ideas in this video. * You are the editor of The Dinosaur Times. Design your newspaper’s masthead, and create the front page headline and story. * Do you and your friends have some dinosaur toys? Organise a display of your dinosaurs. Make clear name labels for them and show three interesting facts about each one on its label. * Gather your dinosaur models or toys. If you don’t have any, create some dinosaurs from modelling clay, play-do or junk craft. Set up scenes you can photograph and tell a cartoon story about your dinosaurs. * If you live near, or can visit, Sydney, go to the Australian Museum and check out the Dinosaurs exhibition. If not, do some research in the library to find out more about dinosaurs. 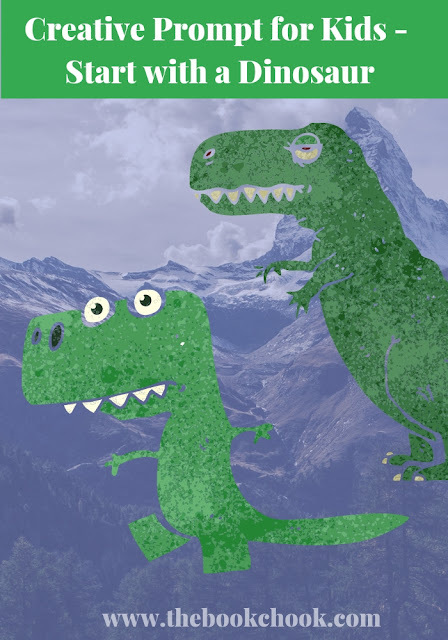 Choose five of the coolest things you discovered about dinosaurs and display them in a dinosaur-shaped poster you can share with others. * Make a sunset silhouette with paint and dinosaurs cut out from black paper. Description here at Krokotak. * You and your friend both have dinosaurs as pets. It’s just wonderful because you love dinosaurs very much. What do you call your pets? Where do they live? What do you feed them? One day something goes wrong. Writel that story. Is there a happy ending? * Make a dinosaur diorama. * What if Tyrannosaurus was actually TyrannoSAWrus? Draw this new kind of saw, and describe it. Are there any other dinoSAWs in your collection? * Make a memory or snap game with cards about dinosaurs. Try it out with a friend. * Use tangram tiles to make a dinosaur. If you don’t have tangram tiles, try any maths equipment or building blocks you do have.